The Bottom Line: One of the year’s best thrillers. Rose Edmunds proves that her Crazy Amy series is only getting better with each installment. Has a long-lost Picasso really resurfaced in Prague? That’s the hope of 84-year-old London resident George Smithies, whose father, a gallery owner, was allegedly tortured and killed by the Nazis in 1939. Having avoided his homeland since his escape to England as a boy, a newspaper photograph of the painting, found in a Czech apartment, has compelled him to consider it. Enter 38-year-old Amy Robinson, a.k.a. 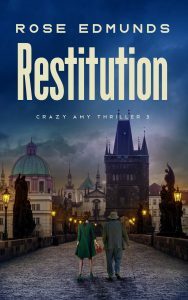 As a newspaper report has it, Amy “will try to help George navigate his way through the minefield of Czech restitution law.” But as anyone who has devoured Rose Edmunds’ first two Crazy Amy series books might guess, that doesn’t come close to describing the extent of the personal and professional danger that awaits her. Amy recently lost Zowie, the unborn child whom she named after the late great artist David Bowie’s son. Actually, “lost” isn’t quite the right word, since it’s quite possible that Amy’s drinking killed him. No matter. Amy steels herself, quite ready for the task that lies ahead. And thus is the genius of Edmunds’ recurring anti-hero. Amy is painfully, deeply flawed. And yet she is utterly brilliant, fearless and to George, indispensable. Once again, Amy’s inner mind chatter crackles with quotables throughout (favorite lines: “If Kafka hadn’t existed, what other word could adequately describe my experiences?” and “As a modern, professional woman, it was embarrassing to admit you’d been seduced by the idea of becoming a princess”) . As Amy and George’s adventure takes them deeper into this labyrinthine quest –spoiler: there is actually a maze – their journey becomes one of mystery, mayhem and murder. But more importantly, each successive chapter brings us to increasingly close quarters with both characters’ quest for spiritual and physical survival. It’s a ride well worth taking. While Restitution is a fine entry point for any new reader, we highly recommend the entire trilogy.